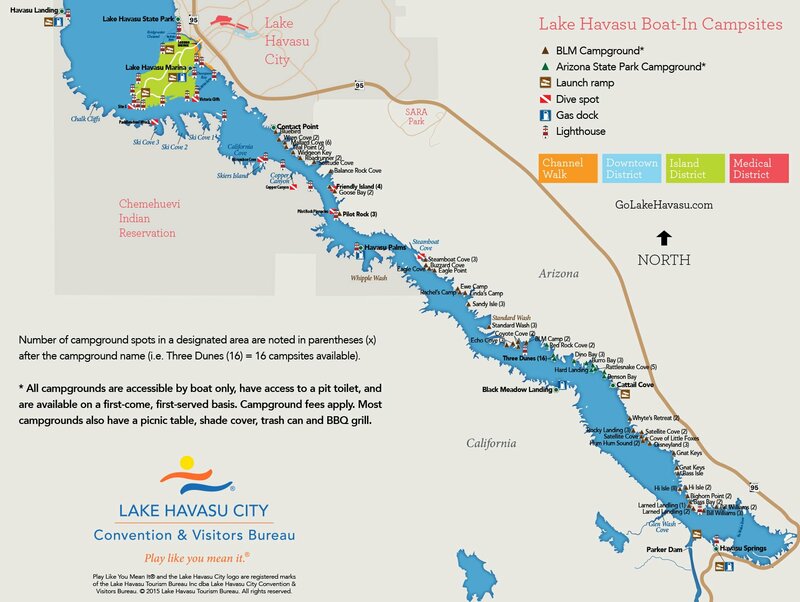 Lake Havasu and the nearby stretches of the Colorado River -- Arizona's "West Coast" -- are known for having a multitude of hidden coves and beaches. Some beaches are only accessible by boat and many have amenities such as barbecue grills, portable restrooms, and shaded picnic tables. 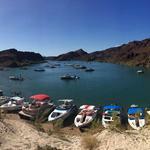 Body Beach is a half-mile long stretch of shoreline on the Arizona (east) side of the lake. On any given day, you can find some of the world's best personal watercraft riders practicing and testing in preparation for their next competition. Every day is a virtual non-stop boat parade when you're at the Bridgewater Channel. The narrow ribbon of 'no-wake' navigable water runs beneath the London Bridge, creating a waterfront for shops and restaurants. 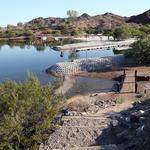 Cattail Cove and Three Dunes offers multiple soft sand beaches along Lake Havasu on the Arizona side of the lake. Along the beaches are a series of small coves that are good hunting grounds for bass and catfish. Friendly Island (aka Beaver Island), located only a little more than four miles from the London Bridge, has several secluded sandy beaches with ample drop-off for easy boater access. It's well-protected from wind and boat wakes and has the added comforts of restroom facilities, barbecue stations, ramadas and trash receptacles, perfect for boat camping. Without question, the 'Sand Bar' is the most populated gathering place on the river. It is located about one mile north of Blankenship Bend. 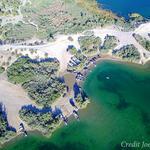 Its wide expanse of shallow water and soft sand bottom lure hundreds of boaters to the Sand Bar during warm weather. Skier's Island is a favorite hot-spot for skiers and wakeboarders as the natural cove and large rock island provides glassy water, even on busy weekends or in windy conditions. 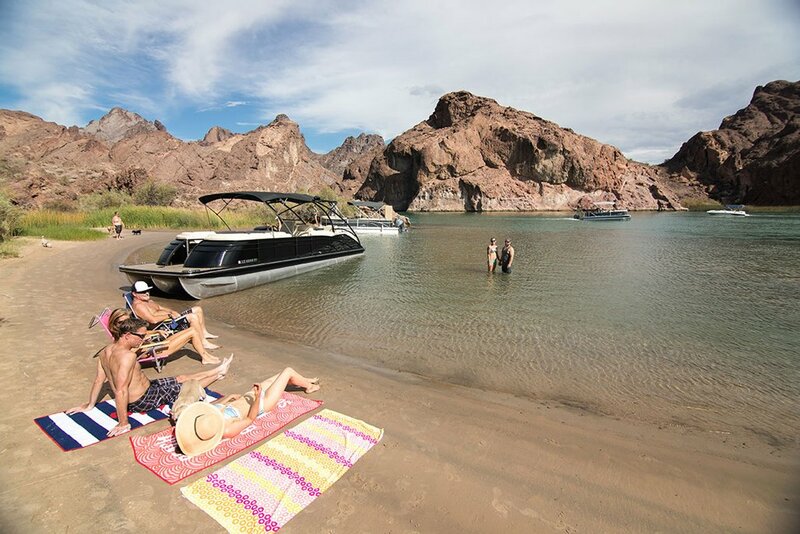 Located near the southern end of Lake Havasu on the Arizona side, Steamboat Cove is known as one of the lake's largest natural, protected no-wake coves and a favorite hot spot for boaters to enjoy for the day or overnight stay. 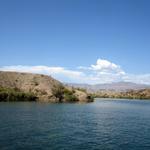 One of the most fun things to do in Lake Havasu City is boating – and camping! 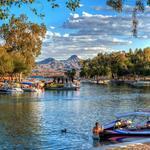 Take in the sights of Lake Havasu while picnicking or camping at one of many beautiful shoreline boat-in campsites. 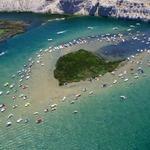 What&CloseCurlyQuote;s the advantage of camping on a beach that&CloseCurlyQuote;s only accessible by boat? Privacy, convenience, and adventure! Boat-in camping is a great way to spend an adventurous weekend. Imagine camping on your own private beach for a night or two. Boat-in camping is inexpensive and provides the opportunity for a unique and unforgettable experience in the beauty of nature. No reservations are needed and there is usually at least one site available, encouraging those spur-of-the-moment getaways whether you are in the mood to kick back and relax, hang out with some old friends, or enjoy a romantic evening under the stars. Just because you're camping, that doesn't mean you can't enjoy the finer things. In the blink of an eye, you can jump on your boat and head over one of several restaurants that provide free courtesy docks. Sit down for some fine cuisine and then head back over to your private beach campsite for the night. Many of the sites have hiking trails that access breathtaking views during the day and the beachfront areas are perfect spots to gaze up at the cloudless, star-filled night sky. Leashed pets are welcome, so all members of the family can get in on the fun! 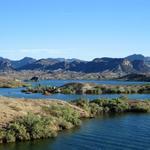 Bring your houseboat, pontoon boat, speed boat, or fishing boat and camp your way. Set up a tent or sleep in the comfort of your own houseboat or cabin cruiser. 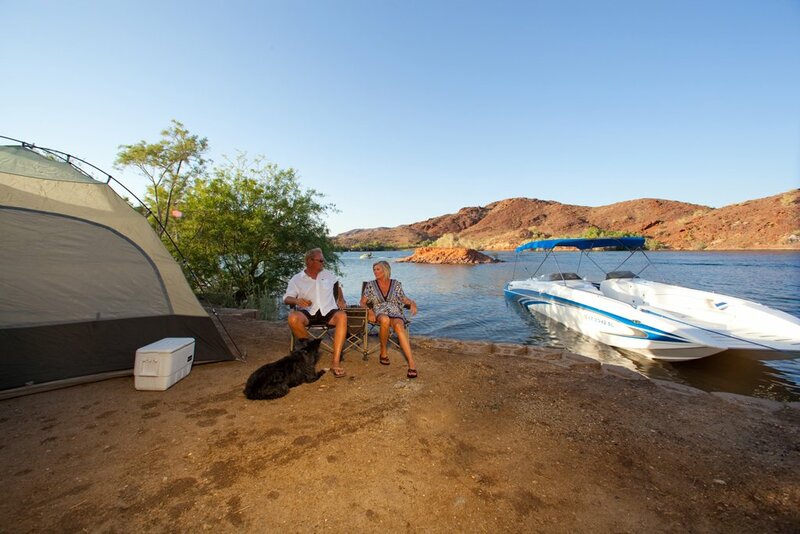 While maintaining the spirit of &OpenCurlyDoubleQuote;roughin&CloseCurlyQuote; it" style camping, convenient amenities are also offered on the majority of the campsites. Restroom facilities, picnic tables, shade cabanas, and built-in charcoal barbecues are installed at most locations.